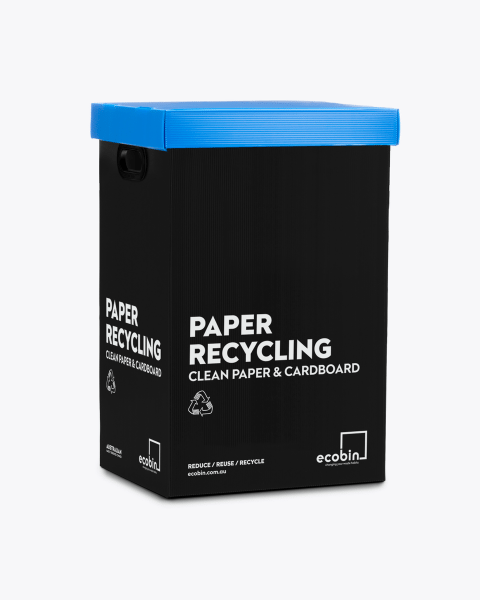 Our indoor paper recycling bins are ideal for your office, schools or any public indoor spaces, and are a useful addition to any waste management program. Our Original bold coloured range is 100% recyclable at the end of its life; suitable for popping into your curb side collection bin. 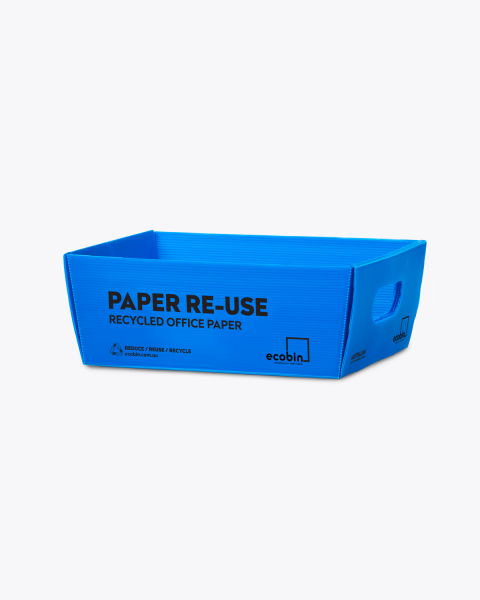 Available in a range of styles, including with, or without a lid and smaller versions for under your office desk, these paper recycling bins and trays are the perfect way to keep you accountable with your paper recycling. Paper is one of the most widely used consumer materials that we have today, and is also considered one of the most important, but unfortunately it comes with a price. Did you know that every tonne of paper that is recycled saves almost 13 trees, 2.5 barrels of oil, 4100 kWh of electricity, 4 cubic metres of landfill and 780 litres of water? But unfortunately, every Australian office worker uses approximately 10,000 sheets of A4 paper each year, and sends over half of it to landfill, instead of diverting it to recycling. When we recycle paper, we lessen the environmental impact that the use of virgin materials has on the planet. HOW DOES THE PAPER RECYCLING BIN WORK? 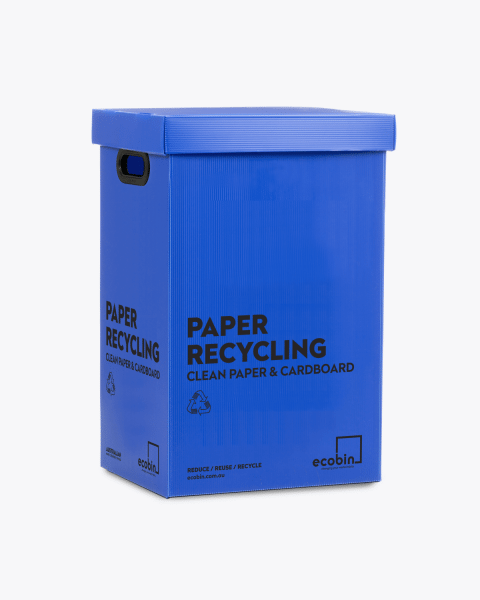 Ecobin’s paper recycling bins are an ideal replacement for unsightly, tattered cardboard containers that sometimes get used for paper recycling. They are clearly labelled for Paper Recycling and coloured blue, the standard colour coding for paper and cardboard waste in Australia. This helps prevent mistakes with waste stream management. Your paper recycling bins help to prevent unnecessary materials from going to landfill. When we recycle paper, and use recycled paper in our offices, we save precious natural resources. Recycled materials use 99% less water and 50% less energy than raw material. Did you know that all newspapers that are manufactured in Australia have a recycled content of up to 40%? This is one of the many reasons why using your paper recycling bin correctly in your office or school is so important. To make sure that your paper recycling bin is being used correctly, ensure you educate your staff, school or household in the correct use of the paper recycling bins. We recommend placing an educational poster above the bin so that when people are throwing their waste away, they know exactly which bin their waste should go into. 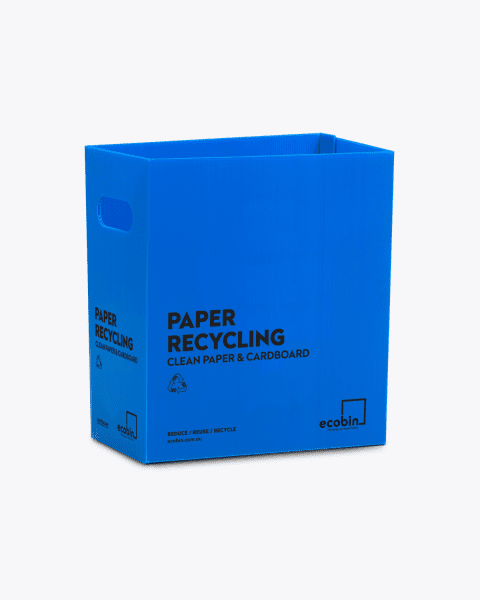 The bold blue colour of the paper recycling bin also helps to eliminate recycling mistakes. 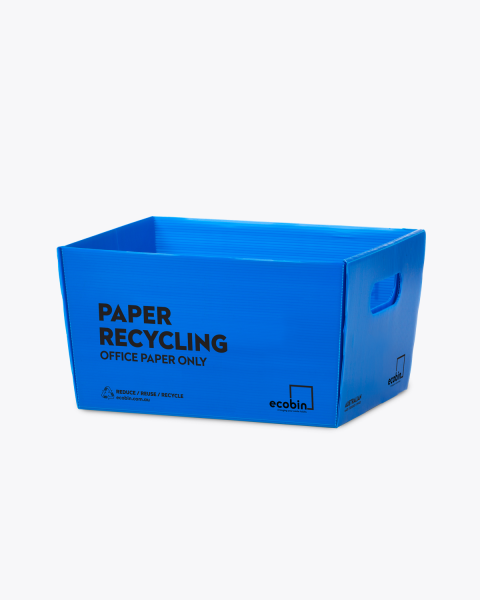 Ecobin’s range of blue paper recycling bins and trays are the perfect addition to your paper recycling program and help to encourage staff to reduce the amount of paper needlessly sent to landfill. 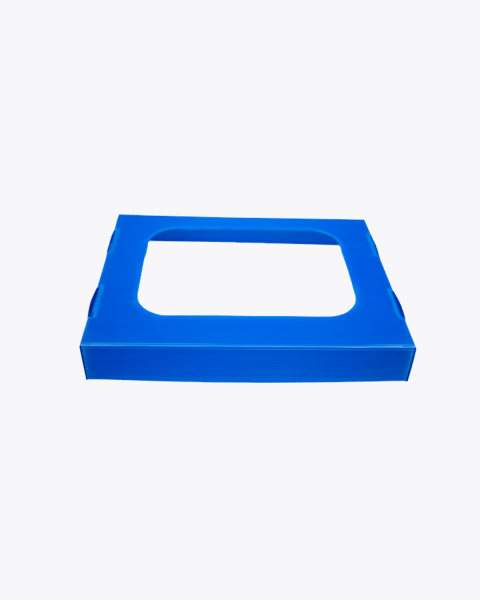 The deskside paper trays come in 7 or 12 litres, sizes that are suitable for popping under staff desks and next to printers and photocopiers. 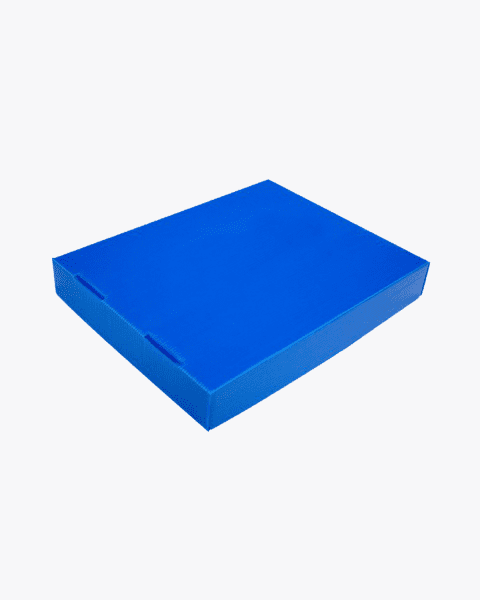 We even offer a specific Re-use paper tray for unwanted paper used only on one side. Encourage staff to pop this paper in the reuse tray to extend the life of that page by using its reverse side. WHAT CAN I PUT IN THE PAPER RECYCLING BIN? If you are unsure what items you can place in your blue paper recycling bin, check out our laminated paper recycling educational poster which clearly lists the do’s and dont’s of recycling in your blue bin. 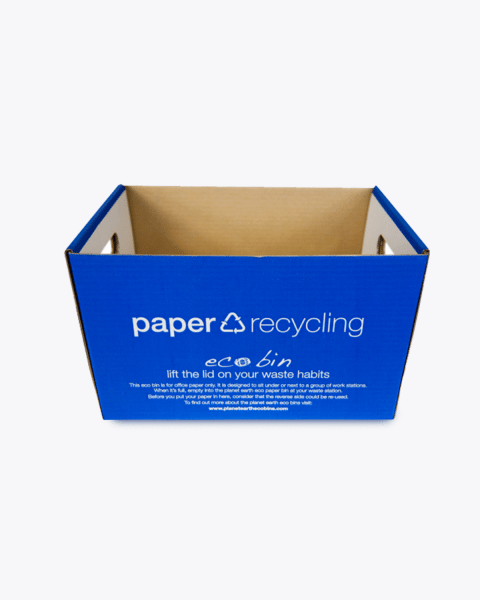 Ecobin’s paper recycling bins and trays are made of corrugated plastic. 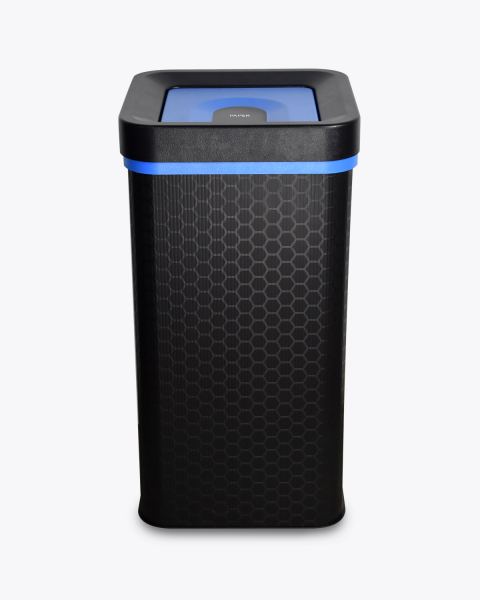 The blue paper recycling bins require substantially less energy to manufacture than injection moulded plastic bins and / or metal bins, which is why these bins are a great alternative. Our paper recycling bins are tough and designed for reuse, but even good things come to an end. Conscious of the impact our products have on the Earth during every stage of their life, we’ve made your paper recycling bin fully recyclable. At the end of its hard life, just pop the bin in your recycling bin for collection.